I get a lot of mail from people overseas asking about the Japanese dog breeds, and how to find/export them. In this post I'm going to try and explain the basics of exporting dogs from Japan. I'm putting out a disclaimer on this that export regulations are subject to change at any time w/o notice, and the information in this post will eventually end up getting outdated. Do your own research and cover all bases. Hopefully though someone will find this information useful. To start with I'd like to answer the most common questions, yes, you can export them, and no, I don't know of any breeders that speak English. 1. They are Natural Monuments so cannot be exported. 2. Breeders will not send dogs overseas because they are protecting their culture. 3. There is an extremely long quarantine. 4. It costs an arm and a leg. While the communication barrier makes it extremely hard for someone overseas to find and export a dog from Japan, it's not impossible. I'm going to try and break down the details here for anyone interested. First, finding a breeder. It is true that most breeders won't send dogs overseas. 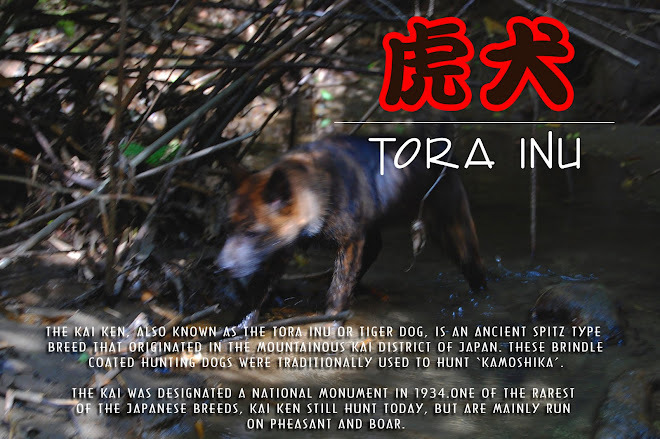 The reason is not that the Japanese breeds cannot be exported, or that they want to protect their culture. The truth is that most breeders in Japan are older, have little grasp of English, don't know the first thing about exporting animals, and the thought of dealing with all the details that go into export and communicating with a foreigner is terrifying. Almost all Nihon Ken breeders are non profit family run kennels. They are not professionals out to breed/sell dogs. It's a hobby. All that being said, these are rare breeds even in Japan. Breeders will want to keep their best dogs for breeding, or pass them on to breeders. I have met a few breeders who did not want to send dogs overseas, but they are few and far between. If you don't have any connections with breeders in Japan, calling the Nihon Ken Hozonkai (Japanese Dog Preservation Society) office is an option (though of course you will need to speak Japanese). I know they have helped to arrange for pups to be shipped overseas. If you're looking for a Kai, the Kai Ken Aigokai (Kai Dog Protection Society) would be the place to call. For Hokkaido Ken, call the Hokkaido Ken Kyokai (Hokkaido Dog Association). Lastly if you're looking for Akita, then call the Akita Inu Hozonkai (Akita Dog Preservation Society). When you call any of these Japanese breed associations, it's important to let them know exactly what you are looking for. Now for the brass tacks. As far as import restrictions in your country, you will have to do some research. I know that even in the States, restrictions vary from state to state. So, all I can give you is the information you'll need to get them out of the country. 1. The dog must be over 2 months old. 2. A examination reservation will need to be made at the Animal Quarantine Center of the airport the animal will be flying out of, preferably at least 7 days in advance of the flight. 3. The dog will need a health certificate stating that the animal is free from signs of Letopspirosis and Rabies, and is in good health. You can have this examination done at any animal hospital, or can make arrangements for the certificate to be issued at the AQC on the day of the flight. This certificate must be issued a maximum of 7 days prior to the day of the flight. If over 3 months, the dog will usually need a rabies shot at least 30 days prior to leaving the country. If over 4 months in most cases it is necessary for the dog to be up to date on all vaccinations. Microchips when exporting dogs from Japan are optional, but some countries require imported dogs to be chipped. Shipping. There are two ways ship a dog out of the country, accompanied (carry on or check in of the flight you are on) and unaccompanied (as cargo). If you are taking pups with you out of the country you will need to make arrangements in advance with your airline. Most airlines require a minimum of 72 hours notice, but it's best to make arrangements when you book your flight. There is a limited number of space for animals on any given flight, and if they are full your dog will not be able to fly with you. To make your reservation you will usually need to give the airline information about the weight/age/type of dog, and the dimensions of the crate you will be shipping it in. Some airlines allow dogs that fit under a size/weight limit to be crated and taken aboard as carry on. This is the exception however. To ship a pup unaccompanied (as cargo), you will need to make arrangements with a shipping company. In Japan you cannot deal directly with the airline about shipping live animals, they will refer you to a shipping agent. The shipping agent will need to have all the necessary information on the dog and crate size at least 10 days prior to your desired shipping date. The shipping agencies have offices near the international airports here in Japan, and you will usually have to arrange some sort of transport to the office. Some companies offer a pick up service. The dog will need to have its exam at the AQC (booked a week in advance remember!) on the day of the flight, and then needs to be taken to the shipping agent. The shipping agent can make the reservation, do the paperwork and take the dog to its inspection for you for a fee. It usually costs around 25,000 yen. Once at the shipping office they will double check all the details, you will make payment for the shipping, and from there the shipping agent does the rest. The Crate: Airline's have regulations regarding crates. Most follow IATA guidelines. To put it simply the crate must be big enough for the dog to stand at full height and not have it's ears touching the roof. The dog must also be able to turn around and lie down comfortably. There are other rules regarding the type of crate to be used, but that's the size regulations for you. Each airline has it's own particular regulations, so you'll need to check with your airline. Shipping Costs: Obviously costs will vary according to destination. Taking a dog back with you as check in though is surprisingly affordable. Fees vary according to airline and destination, but as an example it cost around $200 to take a medium sized crate holding a 2 month old pup to Portland last month. Shipping a dog as cargo gets a bit pricier. For most destinations in the Continental United States shipping will cost anywhere from $1000-$1500.This is for a medium sized 2-3 month old NK pup in a medium sized crate. It is possible that it may cost more to some destinations Stateside. Shipping a crate with 2 pups to France a couple months back did cost closer to $3000. Most airlines will allow pups that are under certain age/size limits to be crated together. The age/size varies by airline. When shipping cargo you are billed by crate size, so there is no difference in shipping costs if you ship 1 or 2 pups. There's a bit more I need to add to this post, but the pups are whining for their evening walk. I'll round this off with a part 2 later tonight or tomorrow. Will add links to relevant websites. Thanks for posting all this info! Thank you for posting important, timely, and practical info!